"[Includes] interesting historical notes describing what life was like for these early immigrants." "The plight of lonely women on the frontier is a key theme, as is the sad truth that pioneer living was not for everyone." The Runaway Friend is Kathleen's seventh mystery for American Girl, and the fourteenth of her twenty-five published books. 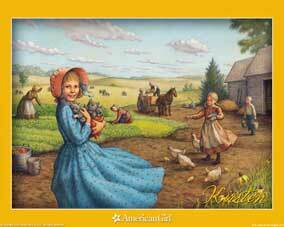 It is written for readers age 9 and up who enjoy American pioneer era historical fiction. Kirsten Larson has been living on the Minnesota frontier for only a few weeks when her neighbor and friend, Erik Sandahl, disappears. 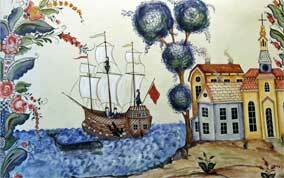 Erik had promised to help the Larsons at harvest time--and he owes Uncle Olav money. Has Erik run out on his promises? Everyone seems to think so—except Kirsten. Can she figure out what's happened to her friend? This story takes place in 1854. The book includes a glossary of Swedish words and an illustrated “Looking Back” essay. 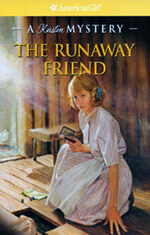 The Runaway Friend was published as a 192-page book in softcover and hardcover (library binding) formats as well as in ebook versions. "This installment in the popular series follows the adventures of a young Swede adjusting to life on the Minnesota frontier in the mid 1800s. When her neighbor Erik, who had promised to help her family with the harvest, mysteriously vanishes, leaving an unpaid loan behind, Kirsten is determined to find out what happened to him. Despite her family's opinion that he merely ran away from his responsibilities, she feels that he may have had different motives. Against her parents' wishes, she investigates and discovers several clues that lead to the truth of Erik's disappearance. Throughout the story, the author weaves in information about the dangers of frontier life, and the narrative concludes with interesting historical notes describing what life was like for these early immigrants." American Girl has "archived" the Kirsten doll and accessories, which means they are no longer selling them. However, this Kirsten story is still available as an ebook from the vendors listed below. NOTE: You can buy 'as new' softcover and hardcover copies of The Runaway Friend and my other American Girl books (signed and personalized as desired) directly from me. To request a quote, click HERE. I always hoped that American Girl would invite me to write a story about Kirsten! The Minnesota setting is close to my own home in Wisconsin. And I've long been interested in the experiences of 19th-century immigrants to the Upper Midwest. Writing The Runaway Friend gave me a chance to think about the many different ways that Swedish people reacted to life in America. Girls like Kirsten faced many challenges with courage, and I find their stories inspiring. I hope you do too!